Switched at birth is a fantasy that many young children imagine growing up, but when it really does happen--as in a recent case in Russia--the two families and the children involved have a tangled weave to unfold. In The Other Son, a French film now playing in art houses, this intensely human tangle is additionally knotted by who and where the two households are: one is Israel, the other the West Bank. That's quite literally a huge wall to overcome. At once, The Other Son plays on two levels. One is the great divide between the two groups involved, as they are basically at war with one another. The other is the personal drama of finding out that the child a mother gave birth to, a child who you believed carried your blood, a child who is genetically yours, is another couple's son. You can see how this has special relevance for not only birth mothers like us, but also individuals raised in another family, another religion. Is your identity determined by your genetic fingerprint of your biological inheritance, or by the environmental influence of where you grew up? Yassin, the Jewish son raised as a Palestinian, the other son, has just graduated from college in France where he is planning to return for medical school, the Israeli family learns. And his real mother is a doctor. France is a bond between the families, because the French doctor was born in France, as were her husband's parents. French is the language they speak fluently at home. The film is in French, Hebrew, English and Arabic, with subtitles as needed. Many scenes will touch our hearts, beginning with the one when the two couples meet at the hospital and learn the awful truth. The grace and sad acceptance with which the mothers handle the situation feels very true as they share photographs of the other son, looking for resemblances. Time will show how they long to know and cherish their original son while still very much remaining the loving mother of the son each has raised. The fathers are a different story: they are concerned about their blood being raised by the "other side," and at least one of the fathers needs reassuring that the son is really his. Eventually, after a strained first meeting of the two families at dinner, the two boys on their own find their way to visit their biological families at home. Yes, my heart leapt when the mothers first touch the sons they carried and gave birth to. And the moment when Joseph discovers that his Arab father is musical too. And when a photograph reveals that one son looks remarkably like someone else in the family. To the director's (Lorraine Levy) credit, she found actors who actually resemble one another, not the frequent mismatch we often find in movies. While the emotions are big, the film is restrained, and the most difficult moments are sensitively underplayed with skillful acting by everyone. Particularly poignant is the moment is when Yassin returns home from Paris, before he knows the truth. His father, a mechanic, is working underneath an old red Mustang. He rolls out on his pallet, briefly greets him but does not rise, and says he will finish working on the car and see him at home. The camera follows him back under the car. This is not his son. Yet this is his son. The son he has loved and raised. One of the ironies of the film is how easily Yassin, the true Jew raised Palestinian, with his new identity papers, is able to cross the check points and come into Israel, and that allows the two sons to become, if not friends, friendly acquaintances. For mothers like ourselves--many who have searched for or longed for the "return" of our children--the film delves into all the psychological implications we can imagine: the difficulty of telling the sons the truth of their origins; their shocked reactions; the mothers' emotions as they hope for some sort of relationship with the son who is theirs, but also not theirs; the reaction of the Palestinian older brother who now feels that his brother, whom he loved, is one of the hated enemy. While some may see The Other Son as a film about the exigencies of the endless Arab-Israeli conflict, and the stark differences between the lives of a middle-class family in the West Bank and one in Israel, it is much more about the emotional interactions of all the characters, and the implications for their lives. All are genuinely nice folks caught it a emotionally difficult situation. Some of the critics have caviled that the similarities between the sons and their biological families are too convenient, not real. But we here at FMF know of these amazing synchronicities, some that have occurred in real life that would be considered too contrived to be used as fictional devices. My daughter and I could not snap our fingers on our right hands; she arrived her at 16 with the exact same sandal as I had, all the more amazing because they were made by an Italian company named Famolare with a modest output; her walk was a close version of mine, as was her heavy step; her strong suit was writing and English; she wrote poetry, as I had when I was young; she liked the easy camaraderie of pubs, as her Irish newspaper columnist father had. 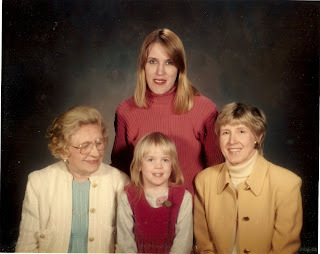 In photographs taken roughly at the same age, she resembles my mother so much they could be taken for each other, if not for the different hair styles. In short, in so many ways she was like me and my family, and like her natural father, Patrick, that it was as if I had raised her. Put that in a movie and the critics will rip you to shreds. We did not, however, have the great divide of a difference of political and religious opinion to conquer. Both of us were raised Catholic. I loved this film. I am encouraging people not of our kind--the sisterhood of first mothers, and adoptees--to see this compelling snapshot of identity crisis. It is a insightful human drama that never sinks to bathos, while uncovering emotional truths that hide behind a question as simple as Who Am I? Films like this can only help to begin to open the door to the self-evident need of everyone to know the truth about themselves. Would the boys have been better off never knowing the truth? Then they would never have found someone who looked like them, who had their same talents and traits, or known the quiet joy that brings. They would have eventually wondered why am I so different from everyone else in the family? How come I don't resemble anyone? I often hear that Late Discovery Adoptees have these questions, and have them answered only when they learn the truth of their origins. Your account of The Other Son and it is driving me nuts--it hits home so hard. As you know, the third part of my recent novel,The Rescuer's Path, recounts the reunion between the Jewish Malca and the young woman Julie, yielded to adoption at birth while Malca grieved her Arab-American lover's death. And I have been very emotionally torn during the recent weeks of Israeli-Palestinian war, so that this film comes at a particularly poignant time. I plan to see it. Whether I'll tell my son of it depends. His adopters were, like me and his first father, of mixed heritage--one Jewish, one Central European--and so Jewishness is less important to him. And sometimes--as we here understand--he shies from being reminded of being adopted, of exactly what our relation, first mother and son, "really" means. There is a story on MSN.com of two boys who were friends and didn't know they were actually brothers. 'So happy I had a brother': Boys meet as friends, discover they are siblings"